The Boston Red Sox are back in the World Series after knocking off the Houston Astros in Game 5 of the American League Championship Series. If the new Evil Empire has you down, read on. The year is 1917, and on the second-to-last day of the regular season, the Washington Senators, who would eventually become the Minnesota Twins, pay a visit to Fenway Park to play the Red Sox. The Red Sox have had a good year, while the Senators, as they so often were, are out of the running again. Despite another winning season for the Red Sox, only 2,070 fans bother to show up for the Oct. 3 game, according to Baseball-Reference.com. Why so few? Perhaps people are distracted. The world is at war, including the U.S., which joined the fight in April of that year. But for those who did attend the game, did they have any idea of what was to become of the two pitchers who took the mound? For the Senators, Walter Johnson gets the ball, and for the Red Sox, Babe Ruth. Yes, that Babe Ruth. As great a player as Ruth was, he was nowhere near Johnson’s equal on the mound. Johnson gets to work and pitches a complete game shutout in ONE HOUR AND FORTY MINUTES to beat the Red Sox, 6-0. It wasn’t a blowout win because this is still the dead ball era when runs are hard to come by. Johnson also helps his own cause by driving in three of the team’s six runs. Ruth goes the distance, too, but gives up six runs on 11 hits. What would become of these two? 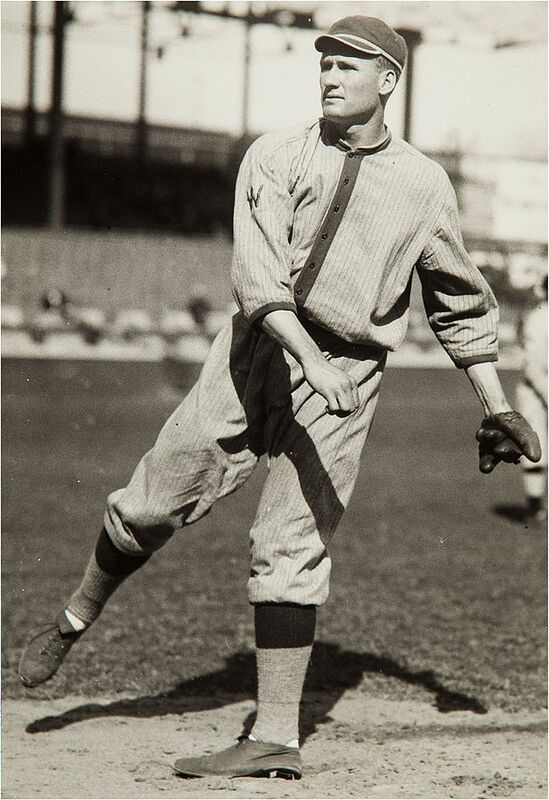 Johnson would go on to win 417 games, pitch 531 complete games, hurl 110 shutouts, strike out 3,500 batters and do it over 21 seasons with a 2.17 ERA. The numbers are mind boggling. Ruth would win 94 games as a pitcher before becoming the most famous baseball slugger of all time. Over 22 seasons, he would hit 714 home runs, drive in more than 2,000 runs, walk more than 2,000 times and he never struck out more than 100 times in a season. He hit .342 for his career. Johnson and Ruth, along with Ty Cobb, Christy Mathewson and Honus Wagner, were in the inaugural Hall of Fame class of 1936. The first time I faced him, I watched him take that easy windup. And then something went past me that made me flinch. The thing just hissed with danger. We couldn’t touch him. … every one of us knew we’d met the most powerful arm ever turned loose in a ball park.